Oh my! I'm so sorry and apologize to anyone who has been wondering why there haven't been any more posts lately. I promise, I haven't fallen off the face of the earth--the semester is running down to the final few weeks, and it's been very busy for me. I have been cooking and I have been taking photos, it's just I haven't had time to post anything. Here are some of the old posts, and I hope to get caught up with them and be up to date in the next day or so. Sorry for all the delay!! I had three asparagus spears left in the freezer, so I used them up. This was another meal I made late at night. Generally speaking, if I make soup, I don't have a lot of time on my hands. Soup doesn't require a lot of dishes and it's over and done with in a flash. Shred the lemongrass finely. Cut the pork belly into 1/2 in. cubes. Heat a pot over medium heat and add the pork belly pieces and the lemongrass shreds. Cook in their own grease until the meat has cooked through and the pieces are browned. Mix together the veal stock, soy sauce, and rice wine and add to the pot. Bring to a boil. Cut the tofu puffs into 1/2 in. slices and chop the cabbage into 1 in. squares. Add both to the soup and simmer 1-2 minutes. Cut the asparagus spears into thirds. Add to the soup along with the enoki mushrooms. Simmer an additional 2-3 mintues, until the asparagus is fully thawed and heated through. Sprinkle with sesame seeds and serve. 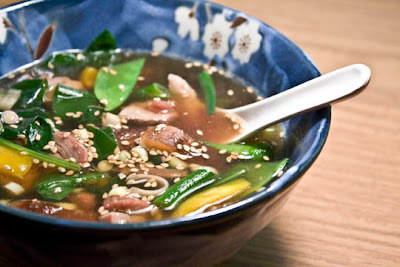 I got the idea for this soup from a recipe for Japanese New Year's soup. OK, now if you really look up a recipe for New Year's soup, it's not really like this at all. I just got the inspiration from there. I had no chicken thawed (what a surprise) and the rice cakes I have aren't really mochi, but it works. You can really use any sort of fish cake you have if you don't have these little cubed fish cakes. Bring the measured water to a boil. Add the dashi granules, soy sauce, and mirin. Stir until the dashi has dissolved completely. 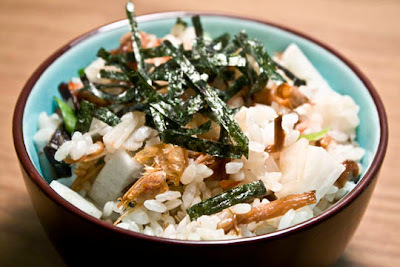 Add the rice cakes and boil 3-4 minutes, or until the rice cakes have softened through and turned a bright white color. Cut the fish cakes into bite-sized pieces and slice the crab sticks in half. Slice the shiitake mushrooms into 1/4 in. strips and separate the enoki mushrooms from one another. Add these ingredients to the soup and simmer for another 2-3 minutes, until the fish cakes have heated all the way through. Cut the snow peas in half on the diagonal and slice the spring onion into 1 in. pieces. Add the green vegetables to the soup and simmer an additional 1-2 minutes. Cut or tear the nori sheet into 1 in. squares. Add the them one at a time to the soup to keep them from sticking to one another. Sprinkle with shichimi togarashi and serve. Another thing to do with udon noodles. I bought a bunch of tofu puffs in Chinatown and I forgot to thaw out meat at the time, so this worked out pretty well. Put the noodle block in a bowl and cover with boiling water. Leave to soak and "cook" on its own. Cut the tofu puffs into 1/4 in. slices, the daikon into 1/8 in. slices, and the sweet pepper into 1/8 in. slices. 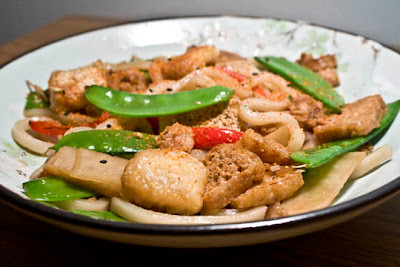 Heat a little oil in a pan and add the tofu puffs, daikon, sweet pepper, and snow peas. Cook 2-3 minutes. Mix together the oyster sauce, water, and soy sauce. Add to the pan and stir to coat. Cook an additional 1-2 minutes. Drain the noodles, rinse, and drain again. Add the noodle to the pan and stir to coat with sauce and heat through. Sprinkle with shichimi togarashi and serve. I was have a bad day a week or so ago, and I decided to make chicken teriyaki (again), but I decided that I wanted the whole thing teriyaki. It was late at night and I didn't feel like doing a lot of dishes, so I tried to keep it all to one small pan. I have to say it looks a little odd with no green vegetables, but it worked. 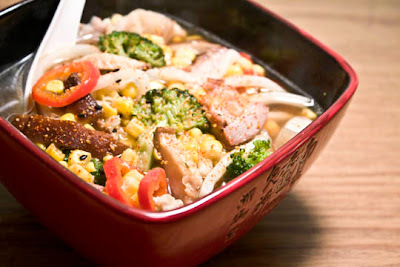 Put the noodle block in a bowl and cover with boiling water. Leave the noodles to soak and "cook" on their own. Using kitchen scissors, snip the chicken meat from the bone. Cut into bite-sized pieces. Heat a dry pan over medium heat and add the chicken pieces, skin side down. Cook 2-3 minutes, or until browned, then turn the pieces over and cook an additional 2-3 minutes. Make sure the chicken is cooked all the way through--no pink! Cut the shiitake mushrooms into 1/2 in. pieces and separate the enoki mushrooms from one another. Add the mushrooms to the pan with the chicken and cook 1-2 minutes. Mix the soy sauce, sake, mirin, and sugar together and add to the pan. It should come to a frothy boil. Continue to cook until the sauce has cooked down to a sort of glaze. Drain and rinse the udon noodles. Add them to the pan and stir to coat with the sauce. Sprinkle with sesame seeds and serve. 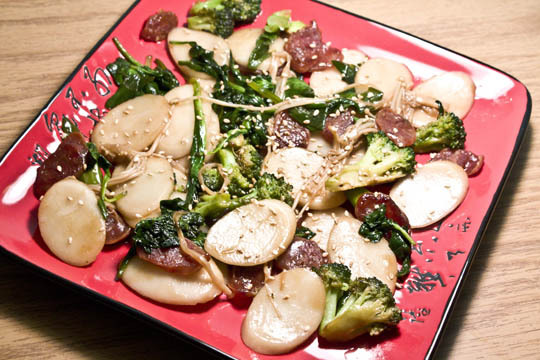 I know I've been doing a lot of things with rice cakes in soups, but I decided to also try them in a stir fry. This recipe turned out well and had some wonderful flavors, colors, and textures, but I must admit that the sauce was a little on the salty side. If I made it again, I would add a little bit of sugar to the sauce to cut the saltiness. Bring a pot of water to a boil, then add the rice cakes. Simmer 4-5 minutes, or until the rice cakes have softened and turned a nice bright white color. Drain and rinse. Set aside. Slice the lup cheong into 1/8 in. slices on the diagonal. Heat a pan over medium heat and add the lup cheong. Saute in it's own oils for 2-3 minutes, or until the sausage has cooked through. Add the broccoli and cook an additional 2-3 minutes. Mix together the soy sauce, fish sauce, and oyster sauce. Add to the pan and stir to coat. Take the rice cakes and add them, one at a time (otherwise they stick together) to the pan and stir until everything is well coated and heated through. Sprinkle with sesame seeds and serve. For the longest time I had seen my Korean suitemate use these little oval shaped rice cake slices in soups, and they looked absolutely delicious. So, I finally found a bag of them the other day at the Asian grocery store I go to in Manhattan near Union Square, and picked them up. I tried them out for the first time last night, and I can guarantee that I'll be using them again! They have a very stiff texture when they're cold, which I wasn't sure I was going to like, but when they cook up they get nice and soft, with a bit of a gummy texture, which I sort of liked. 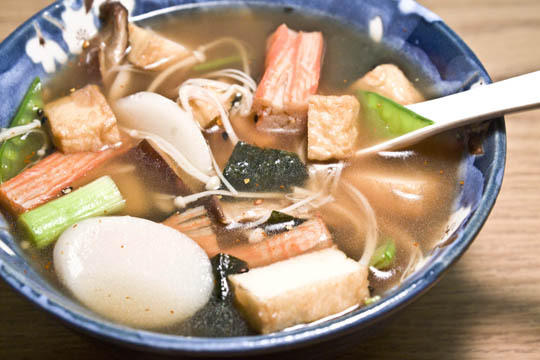 They don't take long to cook and make your soups more substantial without adding any meat, so they're a must-have if you're a vegetarian looking for something new. Last night, I tried them in a miso soup. It turned out really well and I would certainly make it again, but oh, did I have some mishaps when I was cooking! First off, instead of being a smart person and using a spoon to put the dashi granules in, I just tried to sprinkle the grains into the water straight from the jar, which doesn't have a "sprinkle" lid. I tapped a little too hard and I swear an entire tablespoon went into the water! Um, yeah, that's a little too much. I knew the flavor was going to be way to strong, so I had to spoon half of it out and dilute the rest with water, and I'm not sure how much water I put in (I almost never measure anything). At any rate, the final soup didn't really have enough broth and it was really thick. I think it was from cooking the rice cakes. I think next time I'll cook the rice cakes first, set them aside, then add them at the end like I do for noodles--and use a spoon for the dashi granules!! Put the measured water in a pot and bring to a boil. Add the dashi granules, mirin, and soy sauce, and stir until the dashi is completely dissolved. Add the rice cake slices and cook 3-5 minutes, or until they have turned soft. Cut the shiitake mushrooms into 1/2 in. slices, then cut the slices in half again width wise. Chop the spring onion into small pieces on the diagonal. Add both to the soup and simmer 1-2 minutes. 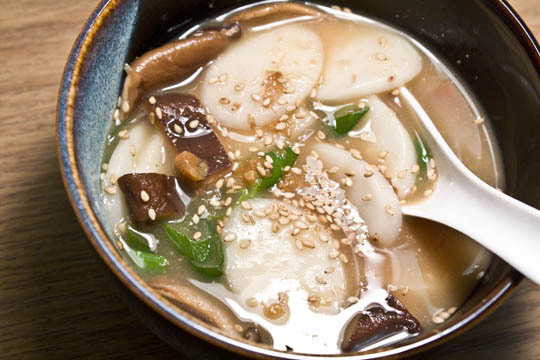 Add the miso to the soup and stir quickly to dissolve, but make sure not to mar the rice cakes. As soon as the miso is dissolved, remove from heat. Sprinkle with sesame seeds and serve. Rice bowl!!! I spent most of the day trailing around the Union Square area of Manhattan today, and so got over to one of my favorite Asian markets in the area. I picked up some enoki mushrooms and these nifty little dried baby shrimp among other things, and decided to toss them all together here. Rice bowls are super easy and delicious. I used a lot of seafood flavors here, but you can really add anything that goes with rice and just mix it in. Put the rice in a pot with a tight-fitting lid and cover with measured water. Bring to a boil. When all the water has boiled away, remove from heat, but do not remove the lid. Leave the lid on for at least 10 minutes. Heat a dry pan and add the crab strips. Heat on all sides until slightly browned. Remove the crab from the pan. Cut them in half width wise and, using a fork, shred the crab into long strips. Gently pull apart the enoki mushrooms and cut in half. Slice the shiitake mushrooms into 1/2 in. pieces, then cut them again in half width wise. Heat a dry pan, then add both mushrooms. Add the soy sauce and mirin--it should come to a frothy boil. Continue to cook until almost all the liquid has been absorbed. Remove from heat. Cut the diakon into 1/16 in. strips, then cut the strips in half width wise. Chop the spring onion into fine slices on the diagonal. Using kitchen shears, cut the nori into 1/8 in. strips. Remove the lid from the rice. Add the mushrooms, dried shrimp, bonito flakes, crab, diakon, and spring onion. Using a spatula, gently fold all the ingredients together. Top with the nori strips and serve. 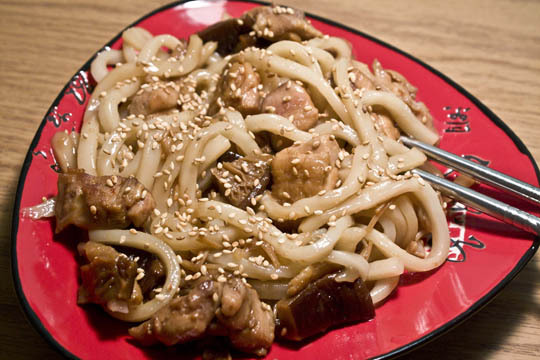 This udon bowl was very easy, especially since the main ingredients were either pre-made or frozen. You can probably pop this one off in about 20-25 minutes. Why did I use two different kinds of broth? Simple. I ran out of turkey stock and I didn't feel like watering it down. The taste comes out very well. If you don't have turkey and/or veal stock, just use chicken and beef stock, or just one or the other. Also, you can substitute dried udon noodles if you don't have fresh (provided that you cook them first), but the fresh udon has a better texture for this soup. Place the udon noodles in a bowl and cover with boiling water. Soak until the noodles are warmed up. Separate the noodles with your hands and drain. Set aside. Cut the pork belly into 1/2 in. cubes. Heat a pot over medium heat and add the pork belly pieces. Cook 2-3 minutes, or until the meat has cooked through. Slice the sweet pepper into 1/2 in. rings. Add the corn, broccoli, and pepper and cook until thawed and heated through. Add both stocks and bring to a boil. Slice the mushrooms into 1/4 in. slices and add to the soup. Simmer 2-3 minutes. To serve, place the noodles int the bottom of a serving bowl, then spoon the soup over top. Sprinkle with shichimi togarashi. Another tom yum soup, this time with squid. Prepare the squid by removing the flippers and the two long tentacles from the tentacle ball and discard. Insert a knife into the hood of the squid and split it so that you can lay the hood out flat on a cutting board. Using the knife, slice a checkerboard pattern into the squid, being careful not to cut all the way through. Then, cut the squid hood into 1 in. squares. Cut the ball of tentacles in half. Also, slice the pepper into 1/4 in. strips. Heat a dry pot over medium heat, then add the squid and pepper pieces. Saute until the squid turns from translucent to white and the checkerboard pieces curl up. Add the tom yum paste and cook until fragrant. Mix together the turkey stock, coconut milk, and chili, and add to the pot. Bring to a boil. This soup is super quick!! I had absolutely no time to cook anything and by the time I got around to dinner all the restaurants were closed, so I whipped this out in probably about 20 minutes. Surprisingly, it was absolutely delicious and very satisfying. 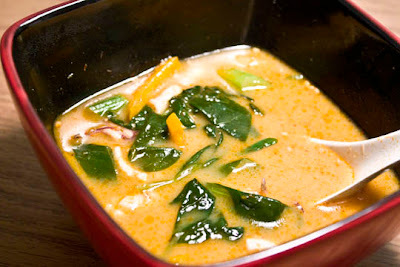 The crisp texture and flavor of the lemongrass really added a wonderful element to this soup. I used some char sui (Chinese barbecued pork) that I had made a while ago and thawed from the freezer, but you can either purchase some from an Asian market, get the recipe from my Char Sui posting from last month, or use another protein of your choice. 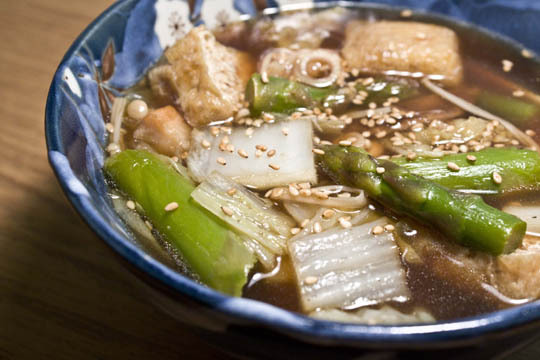 In a pot, mix the turkey broth, rice wine, and soy sauce. Bring to a boil. Chop the lemongrass stalk into thin shreds and add to the soup. Simmer 1-2 minutes. Slice the char sui into 1/8 in. slices, then slice into bite-sized pieces. Cut the sweet pepper into 1/4 in. strips and the mushrooms into 1/2 in. strips. Add the peppers, mushrooms, and pork to the pot. Simmer 1-2 minutes, or until the peppers are softened slightly. Cut the spring onion into 1/2 in. pieces on the diagonal and the snowpeas in half on the diagonal. Add the spring onion, baby spinach, and snowpeas to the pot and cook until the spinach has wilted and cooked down. Sprinkle with sesame seeds and serve. To answer your question, no, I didn't spend ages arranging this plate for the photo. I only spent about one minute if that. Yes, I ate rather late tonight. I've been trying to get caught up on my work, so eating kind of got pushed to the back burner. I'm trying to complete my portfolio book and was having issues with the paper coverings for the covers, but I finally got them pretty much finished, so I bolted into the kitchen to try to cook as quickly as possible. I'm exhausted and I just want to go to bed. Just yesterday I bought a ton of a Japanese spice blend called shichimi togarashi, which is a blend of seven spices including chili, sesame, ginger, orange peel, and some others that I can't remember off the top of my head. I now have enough for the next ten years (10 oz. to be exact), so I thought I'd try it out with some pan-fried mackerel. It turned out to be very good, although it's a little spicier than I expected. If you don't have rice noodles, you can certainly just use plain cooked rice. Cook the rice noodles according to package directions. Drain, but do not rinse. Set aside and keep warm. Cut the mackerel into 1/2 in. slices. Mix the soy sauce, sake, and brown sugar. Add the mackerel and allow to marinate for at least 5 minutes. Mix the corn starch and shichimi togarashi. Coat the fish pieces well in the mixture. Heat oil in a pan, then add the fish. Cook the fish pieces on each side for 2 minutes or so (use your judgment), or until the fish is golden brown and cooked through. Remove from heat. Slice the sweet pepper into 1/8 in. strips. To serve, make a bed of rice noodles on a serving dish. 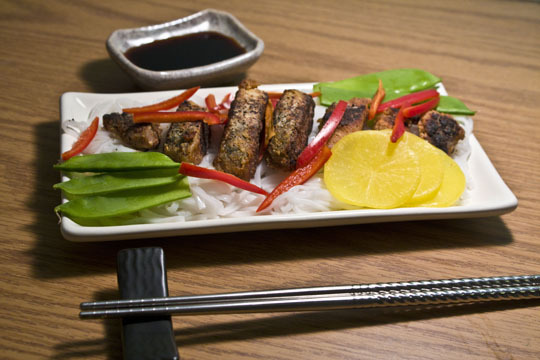 Top with the mackerel, takuan, snowpeas, and sweet pepper. Serve with soy sauce.